More than a month passed since our last Rails digest. And there is no particular need to create it more often, because even the most accurate selection needs time to separate the wheat from the chaff. 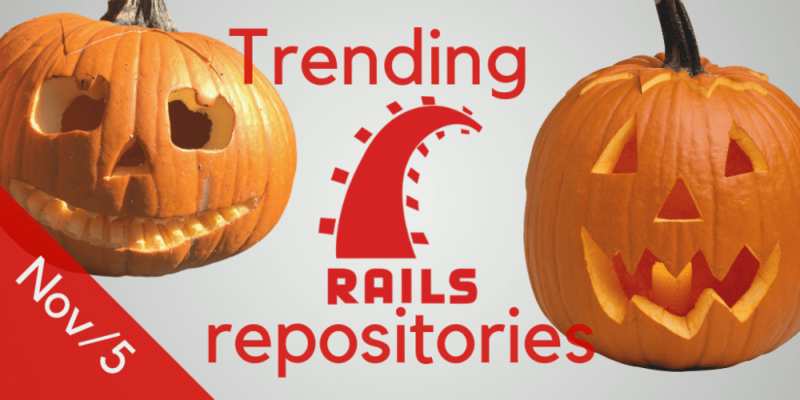 But today we can definitely share with you this mature monthly trending Ruby on Rails repositories digest! Here you will find management platforms, authentication for Rails, gems, web servers, emailing management services, HTTP Servers for Ruby and many more neat open source GitHub repositories! Devise Token Auth is a simple, multi-client and secure token-based authentication for Rails JSON APIs. Designed to work with jToker and ng-token-auth. Rails Event Store (RES) is a library for publishing, consuming, storing and retrieving events. This is the implementation of an Event Store based on Active Record. RailsAdmin is a Rails engine that provides an easy-to-use interface for managing your data. Note that RailsAdmin prior to 1.3.0 have been reported to have XSS vulnerability. Please, update. Phrasing is a gem for live editing phrases (copy) on websites. Phusion Passenger is a lightweigh web and application server, designed to be fast and robust. It takes a lot of complexity out of deploying web apps, adds enterprise-grade features, and makes administration easier. Email Dashboard is an interactive emailing management service with scheduling, templating, tracking and A/B testing. agoo is a high-performance HTTP Server for Ruby that serves static resource at hundreds of thousands of fetches per second. A simple hello world Ruby handler at over 100,000 requests per second on a desktop computer. Karafka is a framework for Apache Kafka based Ruby and Rails applications development. It allows you to capture everything that happens in your systems in large scale, providing you with a seamless and stable core for consuming and processing this data, without having to focus on things that are not your business domain. Rpush is the push notification service for Ruby that aims to be the de facto gem for sending push notifications in Ruby. Its core goals are ease of use, reliability and a rich feature set. TestProf is a collection of different tools to analyze your test suite performance, Ruby Tests Profiling Toolbox. Strong Migrations aimed to catch unsafe migrations at dev time. This gem detects potentially dangerous operations in migrations, prevents them from running by default, and provides instructions on safer ways to do what you want. Bootsnap is a library that plugs into Ruby, with optional support for ActiveSupport and YAML, to optimize and cache expensive computations. Pagy is the ultimate pagination gem that outperforms the others in each and every benchmark and comparison. Action Text brings rich text content and editing to Rails. It includes the Trix editor that handles everything from formatting to links to quotes to lists to embedded images and galleries. Pundit provides a set of helpers which guide you in leveraging regular Ruby classes and object oriented design patterns to build a simple, robust and scaleable authorization system.